Today sees the individual re-issue in paperback and eBook format of the second batch of Desmond Bagley’s novels: The Vivero Letter; The Spoilers; Running Blind; and The Freedom Trap, with release in unabridged audio book format, narrated by Paul Tyreman, to follow soon. To celebrate the second batch of re-issues, The Bagley Brief was fortunate to have an opportunity to interview the author Jeremy Duns who reveals that Desmond Bagley’s novel Running Blind was the inspiration for his own spy novel The Moscow Option. Jeremy Duns is a British author and journalist currently living in the Åland Islands, Finland. His journalism has been published by The Sunday Times, The Sunday Telegraph, The Guardian, Time Out and elsewhere. As a novelist he is the author of the Paul Dark spy novels, published by Simon & Schuster. His first novel, Free Agent, was one of The Daily Telegraph’s ‘Thrillers of the year’ in 2009. The Times called the second book in the series, Song of Treason (originally published as Free Country), ‘a masterly excursion back to the bad old days of the Cold War’, while The Guardian said it was ‘a treat for fans of traditional Len Deighton-style spy thrillers’. The third Dark novel, The Moscow Option was followed by Dead Drop (titled Codename: Hero in the US), a non-fiction investigation of the MI6-CIA operation to run Colonel Oleg Penkovsky. The fourth Dark novel, Spy Out The Land, was published in early 2016. Jeremy has also written the following shorter works: News of Devils; Rogue Royale; Diamonds in the Rough; Cabal; and Tradecraft, a collection of 20 articles about spy fact and fiction. The Bagley Brief: Hi Jeremy, can you remember your first introduction to the novels of Desmond Bagley, did you discover them by yourself or was it through somebody else’s recommendation, and what was that first novel? Jeremy Duns: Hi there, and thanks for having me. I can’t remember the first Bagley I read but I discovered him in the 80s, when I was around 14 or 15 years old and at boarding school in England. My parents lived overseas so I spent most weekends at the school. On Sunday afternoons, a film was shown on a projector in one of the classrooms, usually a stirring adventure story. As a result, I watched Escape to Victory and The Guns of Navarone many times. Spurred by those, I started to eat up paperbacks by Alistair Maclean and similar authors in the school library: Hammond Innes, Wilbur Smith, James Clavell, Jack Higgins, Geoffrey Jenkins, Duncan Kyle and Desmond Bagley. TBB: It’s difficult for me to pick only one as a favourite, I would probably choose, Running Blind, The Tightrope Men and The Enemy. What would be your favourite trio of his novels? JD: I reckon that might be mine, too, as it happens! Several Bagley novels focus on groups of men fighting for survival in some godforsaken place, similar to Alistair Maclean. That’s probably what initially attracted me to his work, but as I’ve grown older I’ve found I tend to prefer the more ‘individualistic’ books, for want of a better term. Alan Stewart and Malcolm Jaggard in particular are protagonists who are working alone. These three also have espionage elements, which appeals to me, and they all feature the Nordic region, where I live. For whatever reason, I find them the three I’m fondest of in the Bagley set. TBB: Has Bagley inspired your own writing in any way? JD: Yes. I’ve written four novels featuring a British double agent, Paul Dark, and with each I’ve had different authors in the back of my mind. So the first, Free Agent, was my attempt at a thriller in the vein of Len Deighton and Adam Hall. My latest, Spy Out The Land, is me trying to channel the likes of Frederick Forsyth, Ted Allbeury and Jack Higgins. With the third, The Moscow Option, I wanted to do something a little like Running Blind. I love the way Bagley used Iceland in that novel, and had the idea of trying something a little similar with the Åland archipelago, where I now live. So Dark is chased across these islands by British and Soviet intelligence, and as he had done with Iceland I tried to make specific elements of the local nature, culture and history integral to the plot. I think craftsman describes him very well, I wonder what you think? JD: I think it’s a very good description of him, though I think he was an artist, too. ‘Craftsman’ has a rather dull sound to it, but there’s little dull in Bagley’s novels. At their best, they’re like Swiss watches of thrillers. Do you agree with Gina’s assessment? JD: Yes, I think all that’s true. Bagley was an unusual author in this field politically – a lot of adventure thrillers at the time were macho, chauvinistic and right-wing. In some cases, there was overt racism. There’s none of that with Bagley, and I always feel when reading him I’m in the hands of a writer with great integrity, empathy and compassion. Even though all his books are different, I always feel a personal liking for their creator. He never lectured, but his view of the world always shines through between the lines, and it’s a view I’m fond of. Linked to this is a sense of open-mindedness and curiosity about the world. You do indeed learn a lot from a Bagley book, and I always finish one feeling like I don’t know enough about electronics, or train sets, or plastic surgery or something similar. He makes me more curious about the world, and lets me go away and find out more. TBB: Bagley was a great researcher, he recognised the need for accuracy and attention to detail, using research material with discretion and conviction in his novels. Personally I find the researching process more enjoyable than the actual writing. With the accuracy of detail evident in your own writing I’m interested to know how you find the process of researching. Do you enjoy it? JD: I think you’re spot on with ‘discretion’ there. Bagley introduces a topic, gives you a lot of interesting background in it, but never bashes you over the head with his knowledge or pretends he has all the answers. Thank you for the kind comment about my own research. I do enjoy it, but the fear of making mistakes can be paralyzing, and of course a way of escaping the coming up with something new. I remember my wife thinking I’d gone a little mad when I was trying to locate contemporaneous menus from Lagos restaurants for Free Agent, which is set in 1969. At some point, you have to let go and just make stuff up. Is that process similar or dissimilar to your own? JD: In some ways. I think if you have a great opening idea, have done a lot of research and thinking and hammer away you can get to the end of a novel, and I tend to do something like that. It’s simultaneously a lot messier and a lot more organized than that sounds, though, and it differs for every book. But I never start with an entirely preconceived plot, and find if I plan too much in advance I lose a lot of spontaneity in the writing, which is something I value highly. That elusive quality people call ‘pace’ or ‘flow’ is crucial to a novel, and I find it flags if I’m too rigid in planning what happens next. You need a mix of structure and intuition. TBB: On matters of espionage, Bagley made it quite clear on a number of occasions that his novel Running Blind was intended as a satire, his attempt to illustrate the utter absurdity of the international espionage scene, and in part he thought he succeeded. I wonder what your assessment is of the novel in this regard? JD: I wouldn’t call it a satire, but it certainly has its absurd moments. The espionage world often is absurd. The ‘wilderness of mirrors’ referred to by the famous CIA counter-intelligence chief James Jesus Angleton is often a step away from farce. To give just one example, Angleton hunted for a mole within CIA for years, and one of his acolytes went so far down the rabbit hole that he concluded the mole was none other than… Angleton. It would be difficult for satire to improve on that. TBB: In Paul Dark you have created an interesting series character, I’m interested to know what you make of Bagley’s character ‘Slade’ featured in both Running Blind and The Freedom Trap. JD: It’s a wonderfully sinister name for a character, I think: Slade. We never learn his first name, do we? Do we even learn if he is British or Russian? He’s obviously based on George Blake, and he has some similarities in character as well as his breaking out of prison. He has a similar unshakeable ideology – for him, the Soviet Union is ‘home’ – and yet he still wants to know what Rearden thinks of him. If you watch interviews with Blake or read his memoir, there’s something similar, I think. Slade also has a superficial charm and ordinariness, but beneath it all seems totally hollow. Again, Blake strikes me as much the same. There was a chilling banality to his treason, unlike the theatrics of Philby, Burgess and some of the others. Comparing the novels Running Blind and The Freedom Trap Slade does indeed appear to have been based on both Konon Trofimovich Molody (aka Gordon Lonsdale) and George Blake. Soviet spy Konon Trofimovich Molody aka Gordon Lonsdale and a rather dour-looking George Blake. Characters connected with espionage, intelligence and security feature in a number of Bagley’s novels: Running Blind; The Freedom Trap; The Tightrope Men; The Enemy; Flyaway; and Windfall. It was clear Bagley had a dislike of international espionage and it’s difficult to know where that dislike originated. During the 1950’s and 60’s he would no doubt have been following the plethora of media reports relating to Secret Service & KGB spies, double agents and defectors leaving many people feeling betrayed and the general public disillusioned. It’s a period you have studied in-depth, is it a possible explanation for his dislike do you think? JD: Yes, and I think that feeling was common, both with the general public and in thrillers of the time. It wasn’t long after the Second World War, and following that you had a glut of books and films that glorified British intelligence’s role in it: Ill Met By Moonlight, The Cockleshell Heroes and so on. The Cambridge ring scandal in particular looked to a lot of people like some upper-class twits were in charge who had been fooled by our enemies simply because they had the right voices and school ties. Len Deighton sent up the bureaucracy of it with organizations with ludicrous acronyms and betrayal around every corner – John le Carré took an even bleaker view with the ruthless machinations in The Spy Who Came In From The Cold. So I think Bagley was very much in line with the feeling of the times here. TBB: Bagley’s 1964 short story ‘Welcome, Comrade’, written under the pseudonym of Simon Bagley and published in The Magazine of Fantasy and Science Fiction can also perhaps be considered a satire of the Cold War. I know you have read this short story and wondered what you thought of it, did you enjoy it? JD: I did enjoy it, yes. It’s a clever story that has a lot of the hallmarks of his novels. The central premise is not that far removed from the MacGuffins of some of his books, such as The Tightrope Men, but it’s just enough into science fiction that it would have been hard to pull off at that length, as would the ending. But I can imagine a longer build-up with the protagonist finding out he is in a conspiracy working well in a novel. It’s a satire, yes, but also of course a metaphor for the Cold War as a whole, in particular propaganda efforts. As is usual with Bagley, there’s lots of interesting information and a few ethical dilemmas to chew on. TBB: A final thought about Bagley and his novels as 2017 sees the individual re-issue of all of his novels. JD: I think it’s great they are being reissued and hope they find a new audience. For some of the reasons we’ve discussed, I think Bagley is a very underrated writer and one who has lasted the course. Many writers from this period are difficult to read now, either because their prose style has dated or their attitudes have. I think Bagley still stands tall on both. I think he was one of if not the most consistent of that great wave of British adventure writers, and his tautly plotted thrillers remain hugely enjoyable to this day. 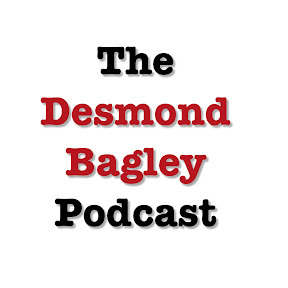 My thanks to Jeremy for taking the time to share some thoughts on Desmond Bagley. For those readers not yet familiar with the work of Jeremy Duns you can find out more about him at www.simonandschuster.co.uk and Jeremy’s website www.jeremy-duns.com. The Tightrope Men and The Enemy are both due for individual re-issue on 13th July this year. Click the titles for pre-order links. Bagley’s short story Welcome, Comrade published in The Magazine of Fantasy and Science Fiction (Volume 26, No. 4, Whole No. 155 April 1964) is currently only available on the secondary market as is the Dictionary of Literary Biography Volume 87 British Mystery and Thriller Writers Since 1940 First Series (Detroit: Gale Research Inc., 1989). An article about Welcome, Comrade can be read on this blog here. Images: Jeremy Duns © José Figueroa; Desmond Bagley © Bengt-Ove Tideman; Covers © 2017 Simon & Schuster, Inc.; © Skerry; © HarperCollins Publishers Ltd; © Gale Research Inc; Molody & Blake © Pluriform; & © Spoilgate Inc.
1. ‘Fortunes in men’s eyes’ by James Michener The Guardian (London: Guardian Media Group, 1972), 23rd February 1972, p. 10. 2. ‘Desmond Bagley’ by Gina Macdonald Dictionary of Literary Biography Volume 87 British Mystery and Thriller Writers Since 1940 First Series (Detroit: Gale Research Inc., 1989) pp. 17-27. 3. ‘Bagley’s equation and how it sold ten million books’ by Maureen Cleave London Evening Standard (London: Associated Newspapers, 1978), 29th September 1978.